Update: Having replayed the game after the release of patch 1.02, the issues with aiming and the jittery sights seem to have been mostly eliminated, though the controller tracking drift is still present. There have been additional options added, horde mode enabled for two-handed weapons, and co-op updated to allow the Aim Controller/DualShock mode to have 2 players. 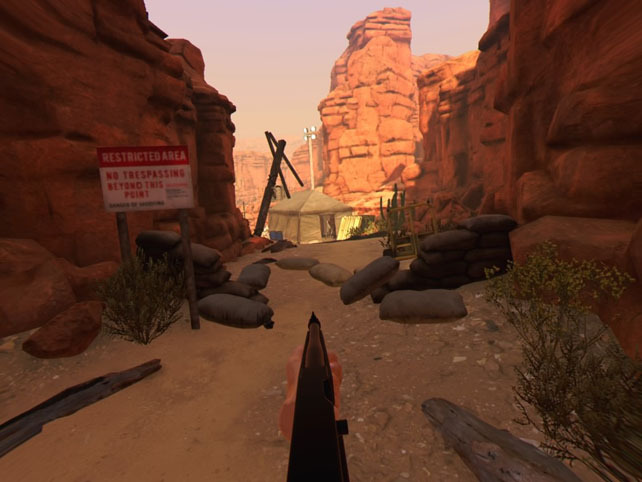 We don’t revise review scores given that our opinion is formed on the release game, and not all titles get updated; but it’s fair to say that Arizona Sunshine is significantly improved on PSVR with this update, and the plaudits received for the Vive version are now better understood. 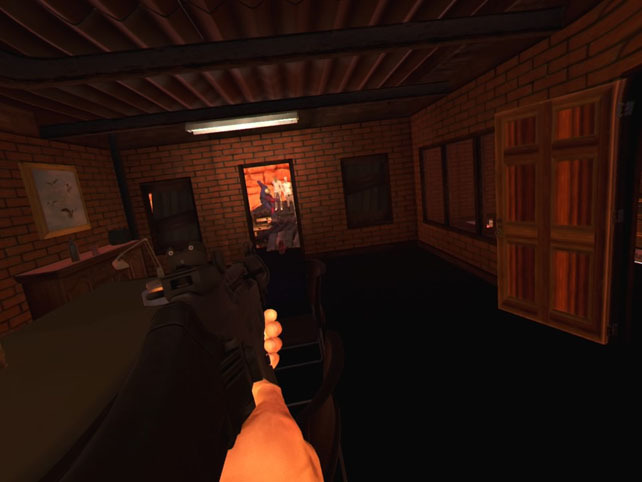 Original Review: The release of an FPS is nothing noteworthy nowadays unless you’ve pumped millions of dollars into the marketing budgets of your latest instalment of a nicely disguised corridor shooter, so much so that if there’s not a battle or duty in your game’s title then it’s likely it’ll go unremarked upon. Enter the world of VR though and there’s a shortage of the staple genre that arguably launched gaming into the mainstream. Why is this? Maybe it’s the fact that the first person motion is vomit inducing for the majority of people. Or maybe it’s because with all the opportunity the new medium offers, putting a headset on to play a twitch shooter just isn’t appealing. Farpoint has had a first stab on PlayStation and has brought with it the Aim Controller to make it feel more immersive. 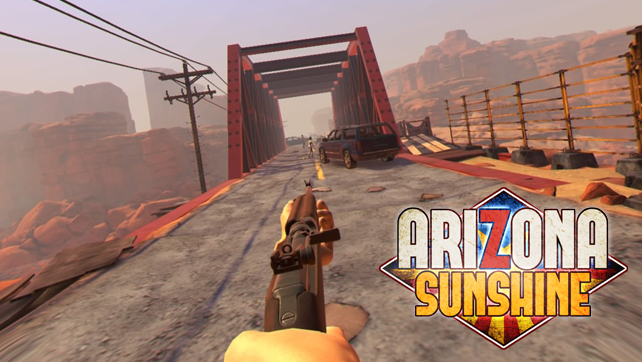 Arizona Sunshine, already available on the PC VR rigs, is now here and also supports the new peripheral – so those who dropped the cash can start to justify their purchase. Can it overcome the inherent issues with putting you in the shoes of the protagonist and provide something a bit different? Yes, it can… with some rather large caveats. 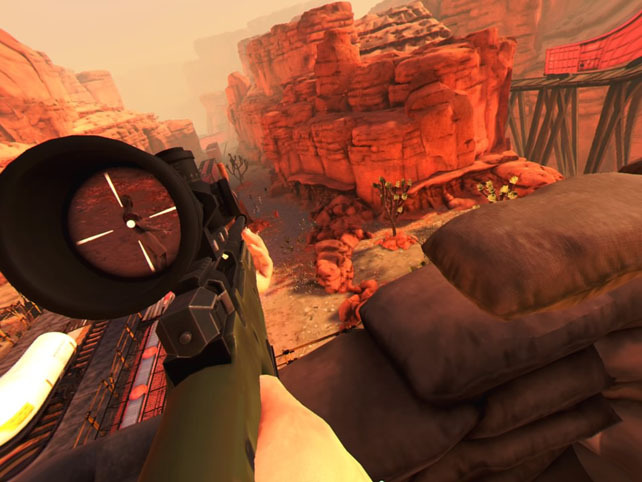 Arizona Sunshine resurrects the undead shooter and places you as the seemingly lone survivor of the zombie apocalypse with the only goal to shoot the hordes and try to find sanctuary. That’s it, nothing more from the story than that, and with only a token nod to background insinuation of what’s happened. If you’re looking for meaning in this world there is none; it’s just you, a rifle and the odd abusive comment towards the “Fred’s” (I’m assuming it’s because it rhymes with Zeds). It’s a linear walk through enemy infested areas with limited ammo and no other way of taking them out. As long as you know what you’re getting into then there’s some things worth keeping going for like that satisfying single headshot, or taking limbs off to slow the fast movers down, or drawing groups to an exploding barrel and conserving your ammo with the one tactical shot. Perseverance is a watchword here though. 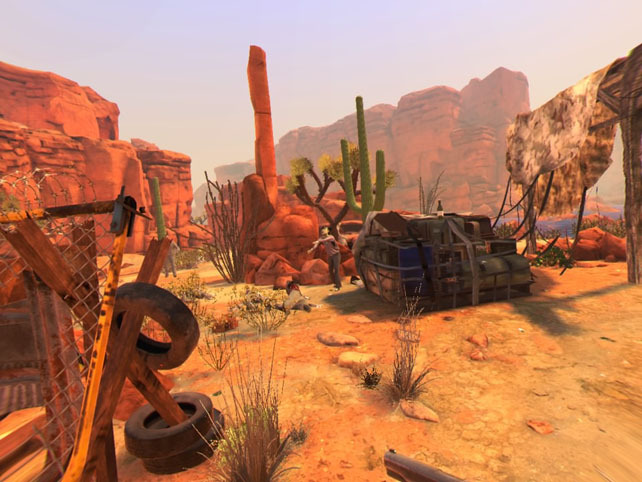 Arizona Sunshine is far from the most user friendly experience I’ve had in VR. On the good side it offers 3 ways to play the game – DualShock4, Aim Controller and Move. The first couple are specific for a two-handed weapon run so you’re always playing with rifles and submachine guns, the latter lets you dual wield like Chow Yun Fat, and each has its own merits and drawbacks. The easiest and most comfortable is the Aim Controller because it’s designed for exactly this type of work; and the DualShock4 also works pretty well with standard FPS controls complimented by pointing the controller to aim. Both though suffer from appalling use of the weapon sights. Try to look down them to pull off the headshot needed to take zombies down and you’ll miss 9 times out of 10 because they stutter and jump around… no matter how still you are. Even point blank range misses at times which is baffling to say the least. Tracking the controllers also proves a challenge after a few minutes so you need to reset the view or shake them around rapidly to get it to re-sync with the right position. Switch to the Move and the weapons have laser sights so aiming is a breeze, but movement is painful to co-ordinate with turn and move being on the face buttons. It’s the least preferable control method of them all. Actual movement around is nicely configurable, letting you choose exactly what feels right to you. Full movement is available and you can mix this up with smooth or incremental turning – a really nice touch to help the motion sickness issues. If you can’t cope with that then there’s the teleport movement option as well where a marker appears on the floor and you instantly move to it, and face in the direction you’ve selected. There’s a bit of fine tuning as you mix and match what works best, and actually being able to test it out in the menu is a bonus. It’s in the trailer that acts as your game selection area that you’re also able to play with the physics side of things with plenty of items to pick up and throw around. Food items can be eaten to restore health with an obvious movement to your mouth, and every item can be thrown, though disappointingly only by releasing the pickup button. Trying to chuck a tin with a physical motion just results in it dropping at your feet. Graphically it’s not bad, the look and feel of the environment works, and there’s some tension built when you can hear a zombie wandering around but can’t see it. And yet even more tension when you’re getting backed into a corner with a swarm rushing at you and your ammo’s running low. There’s no reload to refill your clip in Arizona Sunshine, it will just eject what’s left and leave rounds lying on the floor. Whilst there’s plenty of places to look for new bullets, you’re guaranteed to put far too many into the Freds and leave yourself short. There’s no melee attack other than throwing the nearest item, so running dry and hearing that empty click can mean a relatively swift death. All that said, figuring out where you’re going to get attacked from just doesn’t work over the headset, with the 3D audio putting them behind you even when they’re in front. Having that happen spoils the experience even when you take away the aiming problems, and then you end up realising the lack of textures in some places and the sparseness of the world. It feels like a PS2 FPS in construction, even if it doesn’t look like it. It’s a tough one to recommend is Arizona Sunshine. I spent the first hour thinking it was one of the worst controlling games I’d ever played. Keeping going and working around the issues lets some of the interesting elements shine through, and when I hit a level set in a mine where I had to co-ordinate a helmet mounted light, movement and the weapon aiming, things made a lot of sense. It also has Aim Controller support and somehow that makes you think you need to play this to justify that purchase. However, it’s hard to shake the feeling that the finishing of this game was done on a Friday afternoon. The ideas, level design, weapons and enemies were all done and implemented so the team went to the pub to celebrate, leaving the work experience kid to finish up the controls. It simply spends more time frustrating than delighting. 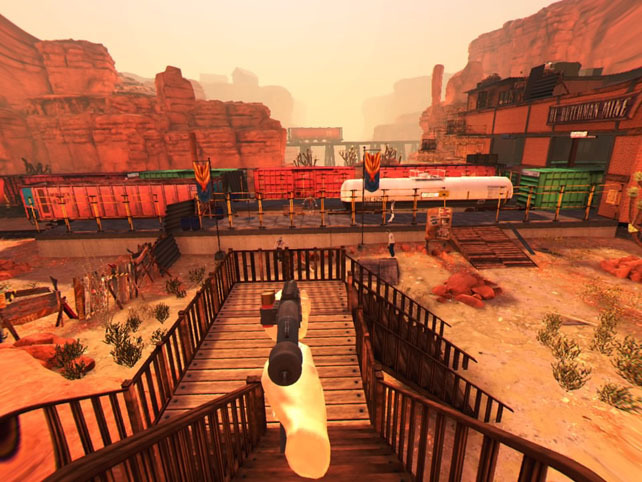 A PSVR review copy of Arizona Sunshine was provided by the Vertigo Games PR team, and the game is available now on PSVR, Hive and Oculus Rift.